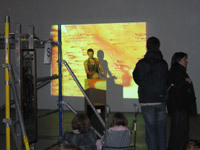 transitstation art exhibition as event with its interdisciplinary character took place in February 2006 in Edinburgh. The third station stop in the young history of transitstation, on tour through Europe encompassing a variety of practices in the areas of visual art, performance art, music, theatre dance, fashion, installation, story-telling and projection, film and video. Within the 24 hour weekend 40 international artists met, communicated and showed their work from their individual backgrounds and chosen genre. The organizers Dagmar I. Glausnitzer-Smith und Charles Ryder arrived from Germany and London to work with their Scottish colleagues Rosemary Strang und Aaron McCloskey. Together they had chosen the controversial location of a commercial, new shopping center in the old, historical Harbor area Leith. The exclusive shopping center Ocean Terminal offered a paradoxical atmosphere to the viewers' experience. Although Ocean Terminal's reputation does not allow associations to the Art World, the management was generously encouraging and supporting the transitstation event. The artists' collective The Forest/ Totalkunst and the Edinburgh Sculpture Workshop invited transitstation from Berlin and provided a loyal and stimulating hospitality. 40 international artists from Spain, France, Germany, Greece, Poland and London arrived to establish new relations with their Scottish colleagues and created a platform of new collaborations and connections. Scottish artists opened their private doors and accommodated all transitstation artists for four days over the transitstation weekend. This is an important element in the planning of all international transitstation events. Transitstation at Ocean Terminal was a confrontation between the world of consumerism and the world of culture. The vast shopping and leisure centre at the heart of Edinburgh's regenerated waterfront proved a valuable cultural-political position to acknowledge the microcosm of transitstation's non-stop art actions. 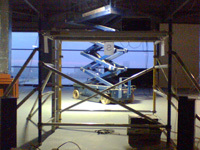 Transitstation Edinburgh 2006 represented a maturation of the original concept: for the second time the on-site logistical preparation, publicity, networking and accommodation for transitstation was managed by the host city partners, who were the artists' collective Total Kunst. Rosemary Strang and Aaron McCloskey handled the Scottish curating processes and logistics in Edinburgh, also working with leading arts organizations, established networks of artists, press relations and musicians. The collaborative nature of this production work, the long-range coordination between transitstation artistic director and host city partners is a crucial stage in the nature of production. transitstation was produced in Edinburgh in association with the Demarco Skateraw Project, the Edinburgh Sculpture Workshop, the Edinburgh College of Art, and The Forest / Totalkunst. Special support was given by Ocean Terminal and G's Graphic and Printing. Assistance with travel costs for artists from Germany provided with the gracious assistance of the Institut fuer Auslandsbeziehungen e.V. (Institute for International Relations).